‘Witch Balls’, as they are called, are spheres of colorful hand-blown glass, created in such a way that thin strands of material are left on the inside, creating a ‘web’ inside the globe. You have probably seen these items hanging in windows, sitting on a pedestal in a yard or displayed in either of our shops and thought they were probably just light catchers or oversized Christmas tree ornaments. While they do serve as beautiful décor pieces, there is also a history to these simple items that bears some explanation. So, this month, we will discuss the history and use of ‘witch balls’. Witches balls came into use more than six centuries ago in Medieval Europe, though the form they took at that time was very rough and not well-defined. During the Victorian era, however, better techniques were employed to create refined objects not dissimilar from the ones available today. The name is actually thought to be an adaptation of the term ‘Watch Ball’, named such for its ability to watch over people and places. Some people suggest that Christmas ornaments were taken from this concept, and were hung from the tree to ward against people who were jealous of the presents beneath or bad spirits intent on ruining the holiday. In cultures that were friendly to arcane practitioners, witch balls were often enchanted by the local witches with charms and spells meant to protect the home and those within. On the other hand, in cultures where witchcraft was frowned on, witch balls has a different use. The bright colors of the sphere were said to attract witches and the powers they used, with the purpose of catching them in the strands of the glass ‘web’ inside. This would protect not just the home, but also the society as a whole because the power (or, depending on the legend, the actual witch) would be trapped inside the object, unable to do harm to anyone else. The modern use has not changed much from the original – they are, essentially, meant to absorb negative energy from the environment and directed ‘curses’ from outside sources. Some sources suggest that it should be hung in an east-facing window, but simply having them in the area is enough to catch stray negativity that might be passing through. 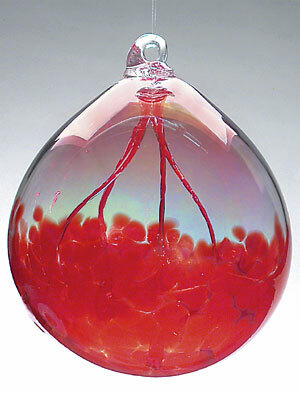 Earth Lore handles a nice variety of beautiful witch balls in several bright colors. Hand-blown in the USA, our witch balls are made entirely from clear and colored glass (even the hanging ring) and showcase the glass studio’s fine craftsmanship.